Noah Hanson, left, and his grandmother, Carol Hanson, of Boulder City, NV, view the ongoing memorial in front of the Armed Forces Career Center on Lee Highway. "We are taking a trip across the country to visit as many state capitol cities as we can," Hanson said. * 2009 — Fort Hood, Texas: Nidal Malik Hasan, a U.S. Army major and psychiatrist, fatally shot 13 people and wounded more than 30 others. Hasan was sentenced to death by military court. While some U.S. lawmakers called it terrorism, the Department of Defense and federal law enforcement classified it as workplace violence. * 2009 — Little Rock, Ark: Abdulhakim Mujahid Muhammad, Memphis native and convert to Islam, fatally shot one soldier and wounded another at a military recruiting center. He was convicted on state murder charges. * 2013 — Washington, D.C.: Military contractor and former soldier Aaron Alexis shot and killed 12 people and wounded three others at the Washington Navy Yard before being killed by police. * 2013 — Millington, Tenn.: Upset over a poor work evaluation, Guardsman Amos Patton shot three superior officers at the National Guard recruiting center. He was convicted of intent to commit murder and sentenced in May to 50 years in prison. * 2014 — Fort Hood: Army Spec. Ivan Lopez fatally shot three people and wounded 14 others before killing himself. * 2014 — Lobelville, Tenn.: A 15-year-old walked into the National Guard armory and killed Sgt. 1st Class Michael W. Braden. Christopher C. Farrar was indicted on first-degree murder charges on July 20, 2015. * 2015 — Chattanooga, Tenn.: Mohammad Youssef Abdulazeez attacked a U.S. military recruiting office on Lee Highway and the Naval and Marine Reserve Center on Amnicola, where he kills four Marines and a Navy petty officer. Abdulazeez was killed by police. 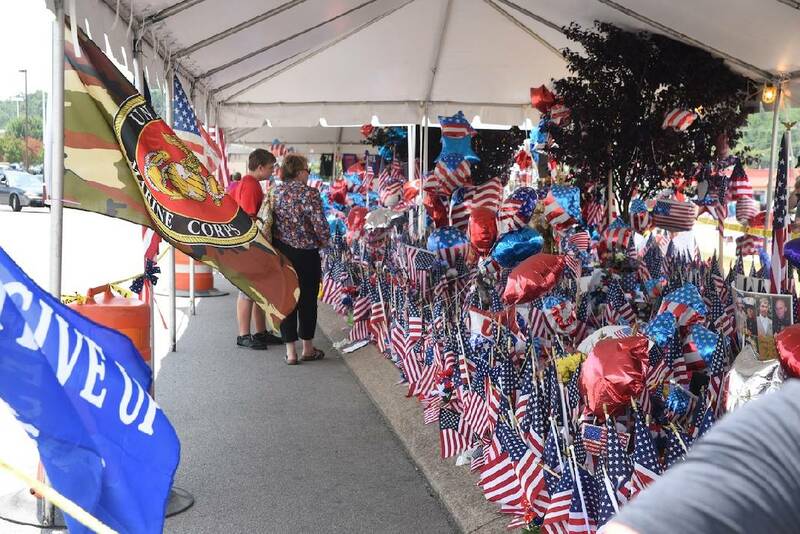 NASHVILLE — The July 16 shooting rampage that killed five U.S. servicemen in Chattanooga devastated families and shocked the nation. But the bloody assault on the Navy and Marine Reserve operations center by a 24-year-old, Kuwaiti-born Hixson resident also set aboil the debate over whether members of state National Guard and U.S. military units should be allowed to carry firearms for self defense at work on American soil. Congressional and other critics said arms should be mandatory in a time when social media propaganda from the Islamic State and other terror groups encourages self-radicalized "lone wolves" to attack U.S. troops. But others have raised concerns about arming soldiers, citing issues ranging from accidents to mental illness, PTSD and workplace violence. * In a July 29 memo, U.S. Defense Secretary Ash Carter acknowledged existing Department of Defense policy authorizes commanders to arm qualified service members, not just military police. Carter said the Chattanooga shootings and the "ongoing threat" underscored "the need for DoD to revise its force protection and security policies, programs, and procedures, particularly for off-installation DoD facilities." Pentagon officials are to provide him their recommendations Friday. * As a result, explained a Navy spokesman in an interview, "for those like Chattanooga, which was a stand-alone facility where it does not have the force protection assets a major base has, those we are authorizing to arm." The spokesman would not delve into additional detail, citing "operational security." But the policy could include either adding armed private security or allowing specially designated and handgun-qualified service members to carry pistols. POLL: Do you agree with the decision to arm certain Guard personnel? * Governors or their state National Guard adjutant generals in at least 10 states have allowed or plan to allow some or all Guard members with state-issued handgun carry permits to go armed. In Tennessee, Adjutant General Max Haston, head of the Tennessee National Guard, acted on Gov. Bill Haslam's directive to review existing policies and announced the state's new policy on Aug. 6. It allows Guard members with state handgun-carry permits to bring their personal handguns to state facilities including armories. It also allows specially designated, 9 mm pistol-qualified Guard members working in or co-located with federal installations to carry federally issued pistols. The U.S. military recruiting office was located next door to a Tennessee Guard recruiting center. Meanwhile, Congress is clamoring for action. U.S. House Armed Services Committee Chairman Mac Thornberry, R-Texas, and Senate Armed Forces Committee Chairman John McCain, R-Ariz., said the pending National Defense Authorization Act will "direct the Pentagon to end the disconnect between the threats our warfighters and their families face and the tools they have to defend themselves." U.S. Rep. Scott DesJarlais, R-Tenn., and the state's other eight Congress members, have their own bill that would allow U.S. military personnel with firearms training to carry handguns on military bases and other installations. And last week, Tennessee House and Senate committees held hearings on the new Guard policy, with some lawmakers wanting to go even farther than Haston's directives. "I don't understand why the military ID card just can't be considered a [gun] carry ID for the state National Guard," said Sen. Mark Green, R-Clarksville, a West Point graduate, former Army Ranger and surgeon who served in Iraq. He said his "great concern" is that radical extremists could attack Guard members in uniform even while they're grocery shopping. It's not as easy as that, Haston said. Fewer than a third of Tennessee Guard members are trained on pistols, he said. The vast majority have only rifle training. Allowing a state military ID for carrying handguns might work "if we trained everybody and I could say every soldier is trained on a 9 mm but that's a stretch," said Haston. For the time being, Haston has ordered all 31 men and women in the state National Guard's seven mall-based recruiting centers, including Chattanooga's, to better-secured state armories. Recruiters won't return to their storefronts, the general said, until the state can install special protections for windows and metal or concrete barriers to keep would-be attackers from crashing through. That was an issue in Chattanooga. Abdulazeez first blasted the windows at the U.S. military recruiting center on Lee Highway, sending rounds into the building and wounding a Marine recruiter. A few minutes later, he crashed a rented Mustang through less-than-adequate fencing in front of the Navy Reserve training center on Amnicola and blasted his way into the building. He killed four Marines and fatally wounded a sailor in the attack. Now federal officials also are taking steps to better protect training and recruiting centers. Haston said it will cost upwards of $18.2 million to make all Tennessee National Guard facilities including armories, recruiting centers and other installations secure with barriers and/or crash-resistant fencing, special video cameras, door-locking devices and bullet-resistant glass or mobile transparent internal barriers. The bulk of that — about $16.6 million — would go toward purchasing the extra-tough, thick metal fencing for armories. State House members say they plan to come up with $1.45 million for security upgrades other than fencing. Senators are talking about the state footing the full $18.2 million tab. During the House State Government Committee hearing, Haston was asked about concerns over guns, mental health and shootings. In a previous Times Free Press interview, Haston had said military officials had to tread carefully and cited a 2013 case where a National Guard recruiter in Millington, Tenn., furious over his poor evaluation, shot three superior officers. "Sir, that absolutely is my greatest fear," Haston told lawmakers. "This is Max Haston's personal opinion. A lot of the problems we're having with all these shooters is that every person, almost to the point you can identify, had a mental heath problem somewhere in their past. And I think we have an issue with that in our country." Haston said what keeps him up at night isn't al-Qaida. Instead, it's "lost souls who have no loyalty to anything and who are easily swayed" by Islamic State propaganda and "want to make a name" for themselves. Federal officials so far have characterized Abdulazeez as a "homegrown violent extremist," but have stopped short of calling him a self-radicalized Islamic terrorist.